I have the reputation in Australia and New Zealand for being the most efficient retriever of any breed. I am told that my ancestry includes both Irish Water Spaniel and Newfoundland, but I�m not exactly sure. My coat is dense, thick and tightly curled and has an insulation quality that helps protect me from the cold. It is also �wash and wear�, meaning that I don�t need any special grooming. When fully grown, I am between 23 and 27 inches tall (58.4 to 68.6 centimeters) and I weigh between 70 and 80 pounds (31.5 to 36 kilograms). We have no Curly-Coated Retriever Breeders listed at this time. 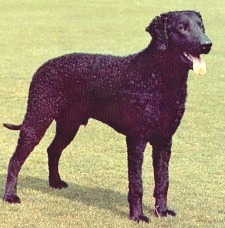 Click here to place your Curly-Coated Retriever Ad!